Who plays board games nowadays? 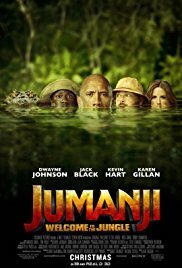 As we all know, Jumanji is one you would want to avoid. Now, it has evolved to tangle those in its grip in the form of a game console. Cast: Dwayne Johnson, Jack Black, Kevin Hart, Karen Gillan, Nick Jonas, Alex Wolff, Ser'Darious Blain, Madison Iseman, Morgan Turner, and Bobby Cannavale. Pros: First thing that got me hooked was the chemistry between the actors. The roles they were playing were spot on. The person that really nailed their part of a teenage "popular" girl was Jack Black, he was hilarious. I liked the new version of the game, it took the basic concepts of what a video game is supposed to be and all the rules involved, which includes things like abilities and how many lives you have which was a real factor in their journey to get out. There is a nod to the previous Jumanji film within the game that I noticed. I could tell in the theatre that most missed it but I hope you notice it as well, so keep a lookout. Dwayne Johnson is a marvelous actor and although he is in a lot of movies he is gold in whatever role he is playing, including this film. Very fun adventure from start to finish. Cons: I think Jumanji was two hours. It went by too fast and could have of been longer. With that in mind, the very end needed a little more depth to see how their lives went on after the game. Nick Jonas was a very meh character but his role in the game was important to bring them all together I guess. Jumanji was very entertaining and I wouldn't mind seeing it again for the laughs and adventures, especially Jack Black playing as Bethany. The action was well done and also the music, especially those classic Jumanjii drums in the background. You'll leave with a smile on your face that's for sure.